This year’s America’s Cup Defense is a Tour de Force of technological innovation both on and off the water, Read on and I will explain. The America’s Cup events are hosted by the Golden Gate Yacht Club on San Francisco Bay, and the defending team BMC Oracle, led by none other than Larry Ellison, Chairman and founder of Oracle in Silicon Valley. The qualifying races are being held on San Francisco Bay. Every aspect of this has been planned in advance to showcase bleeding edge technology, and to turn the yacht races themselves into the spectator sport The America’s Cup has never been, IMHO, it is all classic Larry Ellison. In 2003, I had just agreed to join New Zealand Trade & Enterprise to operate its high tech incubator facility in Redwood City. My first official event was a head to head America’s Cup yacht race on San Francisco Bay. 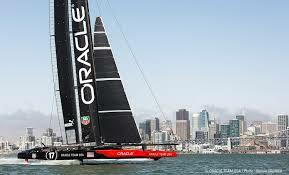 Larry Ellison with his boat, Oracle, had challenged the Swiss team of Alinghi to a head to head race on the Bay. In what became known as the “Fiasco in Frisco,” Alinghi lost miserably to BMW Oracle. But the background story was even more interesting, and that 2003 race on the Bay can be looked back on as Ellison “beta testing” the idea of holding an America’s Cup Defense on San Francisco Bay. Alinghi was skippered by Russell Coutts, a Kiwi, and a number of other Olympic class sailors from New Zealand. In the midst of the previous America’s Cup Defense in the Hauraki Gulf off Auckland, New Zealand, Coutts had jumped ship from Team New Zealand to skipper the Swiss boat, which caused unprecedented uproar in New Zealand, where only two things matter: rugby and sailing. When Coutts and Alinghi arrived in San Francisco for the Oracle race, New Zealand decided to officially “bury the hatchet” with Coutts. New Zealand’s Ambassador to the U.S. at that time, John Wood, came out to San Francisco from D.C., and we threw a classic Kiwi party at the Maritime Museum to honor Coutts and his Kiwi mates. In my first official event for New Zealand, I got to see all of the Kiwi traits and the politics played out. Fast forward to 2013. Coutts was fired by Alinghi in 2004, and now skippers BMW Oracle for Ellison. Shortly after it was announced that the America’s Cup Defense by Oracle, would be held on San Francisco Bay, it became clear that Ellison was determined to make every aspect of the yacht races a showcase for the latest Silicon Valley technology. First, the Bay itself is a stunning backdrop for the event, like no other past America’s Cup venue. Spectators line up from The Golden Gate and Fort Point all the way down to the America’s Cup wharf past Pier 39. No other venue has been able to do this. In an amusing sidelight. Ellison bought a huge Pacific Heights home with a huge window overlooking the Bay, with the intent of hosting America’s Cup parties there. The only problem was an elderly couple who lived below and whose trees blocked the view. In California, normally, there is no legal recourse: the owners of the trees are safe in the right to leave them as they are. But Ellison hired a Marin County attorney, a “tree” specialist, in an effort to force the neighbors to cut down their trees. I believe the jury is still out. Second, the new 72 foot catamarans are completely new technological marvels. Capable of speeds in excess of 37 knots, the cats employ huge kevlar wings rather than sails. A professional Kiwi sailor and friend, described these America’s Cup boats as “man killers.” Indeed, my friend was right, as a famous British sailor was killed in May when his boat turned “turtle” in the Bay and he drowned. Numerous additional safety measures have since been implemented. These catamarans also employ “foils” which enable them to rise up out of the water completely and sail on their tiny wings, enabling the amazing boat speeds. Foiling is the key to winning this America’s Cup. Finally, the television technology has already been nominated for an Emmy. Years ago, when the America’s Cup was held in San Diego, Silicon Graphics experimented with advanced animated graphics for television, and there was live video from the boats, but it was only a small glimpse into the technology being employed for this year’s America’s Cup.. If you have not yet watched a few minutes of the racing, do yourself a favour and do so. You will become hooked on America’s Cup yacht racing. That has never happened before because it was nearly impossible to convey what was going on, and to make it exciting. No more. As you watch a race on the Bay, you will see colored lines and arrows on the water, making the progress understandable. Even more amazing, there are arrows showing the airflow over the boats wings, and arrows on the water displaying the treacherous tidal flows in and out of San Francisco Bay as the boats race. Now I know why no one ever escaped from Alcatraz. The Italian Team, Luna Rossa beat Sweden’s Artemis to lead up to the finals, but the smart money is on Emirates New Zealand and BMW Oracle as the boats to watch.. Grab some popcorn and watch the fun on your HD TV, wishing you were down on the Bay, watching the races live.